Since I made the switch from tampons to menstrual cups in June, I have noticed a significant change in my cycle. 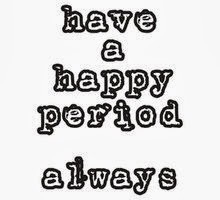 All my life I have suffered with extremely painful cramps throughout most of my cycle that I would always compare to labor pain, a severely heavy flow that would require me to change my tampon every 50-60 minutes on my worst two days, and a LONG period that would sometimes last 7 or 8 days. This is how it was for my mother, my grandmother who even had a hysterectomy, and my sister so I just dealt with it. I always dreaded my period because I knew I would be "out of commission" for almost a week of it. I would get migraines that would put me in bed. One day I would bleed so heavily that all I could do is sit. I was afraid to lift anything because I didn't want to gush blood. During my cycle, it was always less of a "flow" and more clotting and I assume that had something to do with the amount of pain I was in. Also, I had leaks DAILY. At least once a day I would have a gush that would overflow the tampon and cause me to bleed out. I couldn't dedicate my life to standing by the bathroom to make sure I didn't leak. In no exaggeration I contemplated asking my gynecologist if I could get a hysterectomy like my grandmother had but I doubted that "they" still did those unless it was for an extreme reason. For me, there was this obligation to just deal with the pain, discomfort, and inconvenience because EVERY woman deals with it. How can I be complaining? 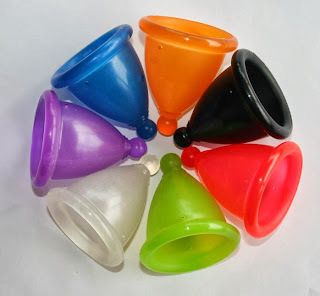 In an earlier entry I talked about when I started my period, what options were available to me, and how I discovered the menstrual cup... please refer back to those if you feel like I am missing "a middle" in this entry. So, getting back to my point... I have noticed a significant change in my cycle. me so I can give you credit. The first cycle I used my cup for was so heavy. I had to empty my cup every 3 hours or so, even through the night. I'm not complaining because that was a huge improvement in my opinion! One or two nights while on my period I didn't get good sleep, but I never got good sleep while on my period and often had to shower in the middle of the night because of the inadequacies of tampons. I noticed clotting in my flow still and it was quite heavy. The one major difference I noticed right away during that first cycle with my cup that I had barely any cramps. I think I told my husband and friends that my cramps were diminished by 80% and that was enough of an improvement for me to continue to lose sleep because I wasn't in horrible pain. I have had four successful cycles using a menstrual cup and have had only one major leak and it was because I didn't assure that my seal was in place before leaving the bathroom. Again, reading my story, you will know that this is a freaking miracle! One of the biggest differences I have noticed since using a menstrual cup is the knowledge and familiarity I have of my anatomy and my cycle. For the first time ever I have felt my cervix move throughout my cycle. I know how much I am bleeding and I know the consistency of my blood. I find that empowering. I have always felt like my period ran my life and now I feel in control. After several months without using tampons I have realized how much my body hated them. I would suggest that every woman at least try switching to reusable menstrual cups. I'm not saying that every woman will love using a cup, I realize it's not for everyone but I can say with 100% certainty that every woman will gain something by trying. Our bodies aren't meant to be stuffed with cotton and chemicals. If you have had success using a menstrual cup, please comment on my blog. Include your favorite product, how long you've been using it, and what made you switch.